Molly the engine and Craig the technician blending up a bountiful concoction. Simpson Park 7 April 2012. Photo by the ever vigilant Alex Wisser. That's an interesting concept! 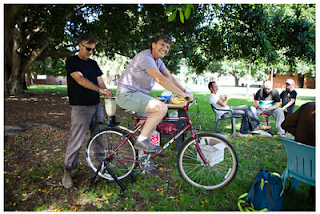 Are these 2 fellows allowing public use or trial of their blender bike? I'd like to give things a spin…. Many of modern day SUV's, vans as well as vehicles are higher than in the past. To help hoist any motorbike on to any ceiling stand for those autos calls for an individual participate in for that NBA or maybe have any hierarchy together with you, for more information click here Hitch bike rack review site. Looks amazing and the idea is brilliant! But I really hate to clean everything after cooking. Don’t you have problem with that? Actually, I had the big ones! But then I read http://juicer.guru/best-easy-to-clean-juicers-review and understood how to do it right. Read it! That has to be useful!